See photos from SHARE's latest events. Plus: new support in PA, help for triple negative disease, and more. Join Us For A Second Helping of Life! SHARE's annual tasting + fundraising event, A Second Helping of Life, is on September 17. 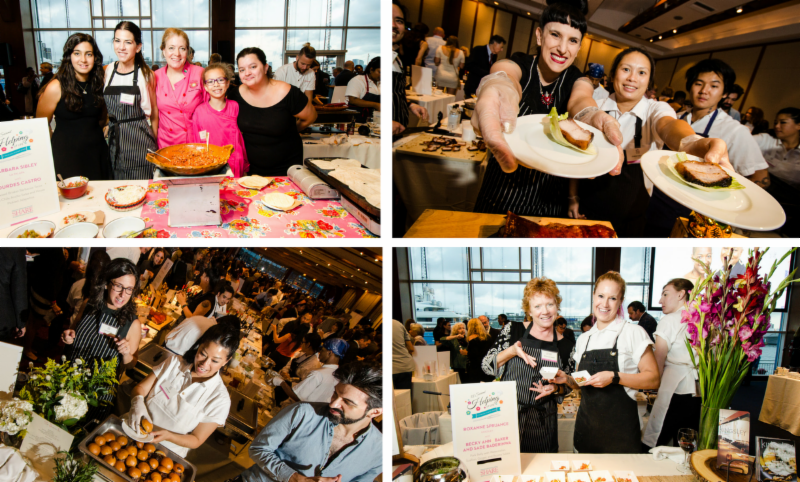 This event, now in its 15th year, supports SHARE's work for women affected by breast or ovarian cancer and features food from NYC's top female chefs, including Barbara Sibley of La Palapa; Angie Mar of the Beatrice Inn; Rebecca Charles of Pearl Oyster Bar; and Alex Guarnaschelli of Butter. We're happy to announce a new video/phone discussion group for women with early stage triple negative breast cancer. Join us to discuss the fear of recurrence, and share tips and advice for coping in a safe and supportive environment. Register here. SHARE has a new support group in Philadelphia for women with breast cancer. Facilitated by a trained peer, this group welcomes women of all ages and breast cancer types. Our next meeting is on July 25 at AACR. Connect with a group of women who understand what you're going through. Register here. SHARE staff were on hand recently at the annual We Run for Hope 5k/10K Run and Walk! SHARE would like to extend a special thank you to Tricia Singh, Executive Director of We Run for Hope, who was inspired to create this event while caring for her mother, who was diagnosed with metastatic breast cancer. View photos from the event here. SHARE held its annual Pink and Teal Reception on June 20 at Hearst Tower in NYC. We would like to thank all event sponsors and attendees for their continued support and generosity towards SHARE, which helps make our work for women affected by breast or ovarian cancer possible. See pictures of the event here. SHARE is excited to announce the start of our young professionals advisory board! This group will support SHARE's work for women affected by breast or ovarian cancer through fundraising and volunteer opportunities. To find out about our upcoming informational session, please contact our Administrative Manager. SHARE's Pink and Teal Seminar, which offers information on breast and ovarian cancer in the workplace, held a seminar at the American Express offices in NYC on May 8. Over 31 employees, from states including Florida, Texas, Michigan, Georgia, Arizona and South Carolina, attended online and in-person! A Pink and Teal Seminar in your workplace can empower you and your colleagues to take control of your health and prepare for a future family health crisis. Contact Arlene to schedule a free Pink and Teal seminar today.